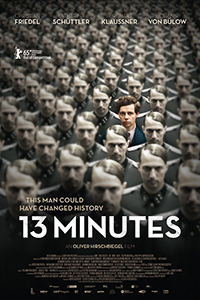 The problem with Oliver Hirschbiegel’s 13 Minutes (2015) is ultimately the weight of history. Where the knowledge of what is to transpire elevates every scene of his monumental Oscar-winning portrayal of Hitler’s final days, Downfall (2004), in this tale of a failed assassination attempt it hamstrings the drama. Whenever a film opens with the chronological conclusion of its narrative thrust – usually a negative one – the aim is to capitalise on the eventual outcome for dramatic irony, or impending tragedy. Here, the story begins with the film’s defining act and most accomplished sequence but, despite handsome execution, never hits those heights again in a plot where familiarity severely dampens the squib. A botched explosion lies at the centre of proceedings – or, to be more accurate, a mistimed one. It’s a painful twist of the knife for would-be assassin, Georg Elser (Christian Friedel) who is a watchmaker turned bomb-maker whose pendulum, it turns out, is slightly out of whack. In a tense opening, he struggles in the dark to prepare his device and place it above a podium at which the Führer will later speak. The light of a pocket torch strafes across the inky frame with accompanying ticking of a timepiece emphasising urgency and successfully raising the heart-rate. Apprehended by security services he is informed that the detonation was thirteen minutes too late; hence the title. What follows takes two paths; one that documents his subsequent interrogation and another that chronicles the motivations for his undertaking. The reasons, however, fail to either be revelatory or especially dramatic. Friedel does well with the thankless task of playing a man slowly mobilised by the Nazis’ increasing dominance throughout the late 30s leading to his attempt on Hitler’s life in the Bürgerbräukeller. More concerned with his burgeoning relationship with a married woman, Elsa (Katharina Schüttler) in his small Southern-German village, these flashbacks struggle to grapple with a wider discourse on Nazi collusion and resistance. Friedel manages to convey Georg’s intellect and charisma with a cocksure charm and a growing sullen intensity, but largely viewed in isolation – as the real Georg was – it lacks power and insight with regards to the political context. There are moments of interest but they are nothing that audiences have not seen dozens of times previously. What proves to be more effective are the scenes after his capture. Though punctuated with familiar and unpleasant torture, this part of the film also explores the internal wrangling surrounding the need to pin the attempt on Communists rather than accepting it is the personal work of one man. Burghart Klaußner plays Nebe, the officer tasked with interrogating Elser who is conflicted about attempting to force a false confession of conspiracy when it is clear the plan was self-devised. Indeed, he is also the face through which Hirschbiegel suggests the beginnings of questioning of Hitler’s guidance within the party – though, of course, such insubordination cannot stand. Sadly, these more intriguing elements are largely lost beneath the otherwise plodding narrative, and while this might be a definite step in the right direction for Hirschbiegel after the universally derided Diana (2013), 13 Minutes is a long way from the mastery of Downfall.